I feel the same way about Calvin. On the one hand there are many who claim to be ‘Calvinists’ and yet have never read Calvin himself; and on the other hand there are many who despise Calvin and yet they have also never read Calvin for themselves but only rely on what others say about him (and many of those people have also not read Calvin either!). What can be done to redress this situation? Robert White and the Banner of Truth Trust have provided the answer in the form of this handsome volume which describes itself as ‘Calvin’s own “essentials” edition’ of his justly famous Institutes of the Christian Religion. Calvin’s Institutes is a monumental work of biblical and spiritual theology that stands among the greatest works of Christian theology and Western literature. The Institutes was first published in Latin in 1536 and set out in its final form chosen by Calvin in 1559 (a French edition made by Calvin appeared in the following year in 1560). White describes the Institutes ‘in its final, definitive form’, as ‘a work of rare brilliance, providing as they do a wide ranging introduction to biblical theology and an authoritative statement of Reformed doctrine’ (p. vii). In between these two editions, three intervening editions of the Institutes appeared: 1539, 1543, and 1550 (the changes made in the 1550 edition have to do more with formatting than the addition of much new material). In all, the Institutes passed through six Latin editions and three French translations made by Calvin before receiving their final form (viii). This present volume by Robert White is a translation of Calvin’s own 1541 French translation of his 1539 Latin edition of the Institutes. White formerly taught in the department of French studies at the University of Sydney, Australia, and has a special interest in the Reformation in French-speaking areas of Europe. He is the translator of Calvin’s Sermons on the Beatitudes,3 Songs of the Nativity,4 Faith Unfeigned,5 and A Guide to Christian Living,6 all of which have also been published by Banner of Truth (from the blurb on the inside jacket cover). Robert White is thus ideally suited to translate this book. But the question that has to be asked it this: Why would someone want to read this earlier edition of Calvin Institutes (1539/1541) when the later, definitive edition of 1559/1560 is available? There are a number of reasons why I highly recommend this edition. The success of the 1536 Institutes and the Reformer’s own desire for a fuller exposition of the faith accounts for a second, much enlarged, Latin edition of 1539, and for the decision to publish, in 1541, a French version intended no longer for educated Latin speakers, but for a much bigger audience of Calvin’s countrymen, in order to enable them to ‘further profit in God’s school’ [Calvin] (p. viii). White explains his desire ‘to allow the author of the Institutes to speak as naturally in English as he does in French’ (p. xii). He has achieved his goal admirably. 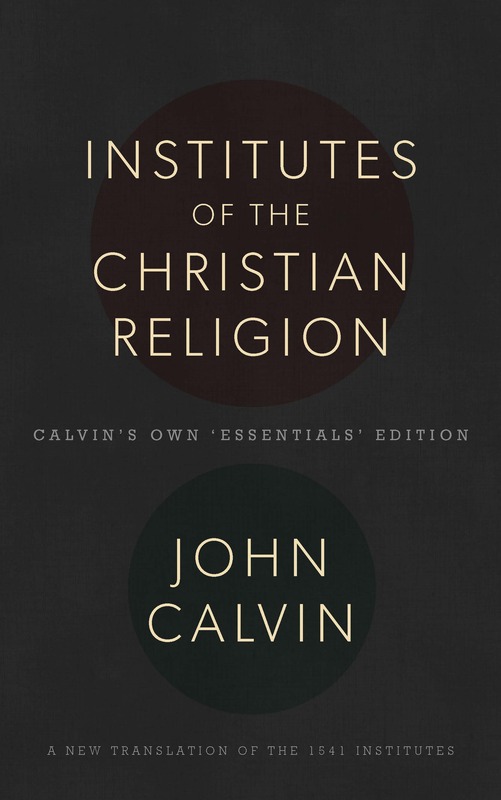 White’s own skilful English translation preserves Calvin’s desire for an eminently readable edition of his Institutes that will be warmly welcomed by all. (3) It has a more conversational, pastoral quality, as it was written during Calvin’s first real pastorate in Strasbourg. By the time this edition was published in 1541, Calvin had completed his fourth year of pastoral ministry to French-speaking religious refugees in a German-speaking land. Calvin’s work is thus not the product of an ivory tower theologian but rather that of a pastor-theologian who shared in the daily lives of those who had fled persecution in their homeland. Thus this book is just as much for the person in the pew as it is for the preacher in the pulpit. (4) This was the first time that Calvin introduced an extended discussion of the doctrine of justification by faith and grace alone, in keeping with the fact that Calvin was working on his Romans commentary at the very same time (see chapter 6, ‘Justification by Faith and the Merit of Works,’ pp. 351-428). Calvin begins by noting that it is ‘the chief article of the Christian religion’ (p. 351). Calvin then defines justification in the following terms: ‘That man is justified before God who in God’s judgement is reckoned to be righteous and who is acceptable to his righteousness’ (p. 352). That person is accepted as righteousness when he ‘grasps by faith the righteousness of Jesus Christ; when clothed with it he appears before God’s face not as a sinner but as righteous’ (p. 352). This righteousness becomes ours, says Calvin, because of our union with Jesus Christ (commenting on 2 Cor. 5:21): ‘We observe here that Paul situates our righteousness not in ourselves but in Christ, and that righteousness is ours for no other reason than that we share in Christ, for in possessing him we possess along with him, all his riches’ (p. 360). The other two key elements of justification that Calvin discusses in this chapter are the forgiveness of sins (pp. 358-60) and the importance of affirming that justification is ‘by faith alone’ (pp. 356-58). This, however, I can promise: it can serve as a key and opening, allowing all God’s children access to a true and proper understanding of holy Scripture. In future, therefore, if our Lord gives me the means and opportunity to write commentaries, I will be as brief as possible. There will be no need for lengthy digressions, since I have here provided a detailed explanation of almost all the articles which concern the Christian faith. Where is this ‘detailed explanation of almost all the articles which concern the Christian faith’ to be found? Answer: The Institutes. The Institutes provided the reader of his commentaries with a doctrinal key for interpreting Scripture and a more systematic treatment of theological issues raised in his commentaries. Thus for Calvin, the knowledge of God is not just knowledge about God but a personal knowledge of God, a ‘yearn[ing] for him,’ a seeking him, and a finding of all our good in him (see also pp. 8-9). Calvin then proceeds logically and methodologically from the knowledge of God (ch 1) and man (ch 2) to the law (ch 3), faith (with an explanation of the Apostle’s Creed, ch 4), repentance (ch 5), justification by faith (ch 6), the relation of the Old and New Testaments (ch 7), predestination and the providence of God (ch 8), prayer (cf. 9) the sacraments (ch. 10), baptism (ch 11), the Lord’s Supper (ch 12), the powers of the church (ch 15), civil government (ch 16) and the Christian life (ch. 17). There is such a rich feast here! The appendix then provides a very helpful Thematic Outline which correlates the principal topics which appear in the present 1541 edition with those of the 1560 edition, showing where the same topics appear in both editions. I cannot more highly recommend this eminently readable, beautifully bound, theologically profound, spiritually uplifting translation of Calvin’s monumental Institutes of the Christian Religion. And please don’t be put off by its size. If you read just two pages a day you will have read it in a year! More than that, you will be the richer and better for it. It is a book that will not only inform your mind, but under God transform your life. Take up and read! Taken with permission from Vox Reformata (links to Banner titles added). Rev. Dr Martin Williams is Lecturer in New Testament and Greek at the Reformed Theological College, Waurn Ponds, Victoria, Australia.